One estate planning scenario you have probably never considered is death and bankruptcy. In other words, let’s say you file for bankruptcy protection but suddenly pass away while the case is still pending. Does the bankruptcy case die with you? And what happens to your estate? To answer these questions, first you need to know a few things about bankruptcy. Unlike the administration of probate estates, which is handled at the state level, bankruptcy is strictly a federal matter. But like probate, bankruptcy also involves turning your assets over to a third party–in this case a bankruptcy trustee–who must administer the property in accordance with certain legal rules. The trustee’s role largely depends on the type of bankruptcy case. Individual debtors typically file for either Chapter 7 or Chapter 13 protection. In Chapter 7, which is known as a “liquidation” bankruptcy, the trustee gathers all of the debtors’ assets that are not subject to any specific bankruptcy exemptions. In many cases most or all of the assets are exempt, meaning the debtor can keep them. Any non-exempt assets may then be liquidated by the trustee to pay off the debtor’s creditors. Since there is little direct participation on the part of the debtor in a Chapter 7 case–the trustee does most of the work–the fact the debtor dies before the case is over actually changes very little. Under federal bankruptcy rules, the liquidation simply continues as if the debtor were still alive. 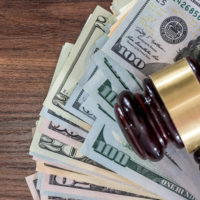 Once completed, the bankruptcy court will issue a “discharge,” meaning any remaining unpaid creditors cannot seek to collect on their debts from the debtor’s estate. Now, Chapter 13 cases are a bit more complicated because the debtor is expected to play a more active role. Chapter 13 is not a straightforward liquidation. Rather, the debtor must submit a plan to repay his creditors over a 3-5 year period using his or her “disposable income.” The debtor actually makes a monthly payment to the trustee, who in turn pays the creditors. Obviously, it is difficult for the debtor to stick to a payment plan if he or she is deceased. The bankruptcy court does have the discretion to dismiss the case. But in many cases, the estate and the debtor’s family–particularly a spouse in cases where married couples filed for bankruptcy together–may wish to continue bankruptcy administration. This can be especially helpful if the bankruptcy estate includes secured debts, such as a home mortgage, attached to assets the estate or its beneficiaries wish to keep. Administering the estate of a debtor in bankruptcy is no simple matter. The personal representative should always seek out independent advice from an experienced Fort Myers probate lawyer. Contact the Kuhn Law Firm, P.A., at 239-333-4529 today to schedule a free initial consultation.